Rare pair of war soldiers wearing tiger head hoods adorned with a red round collar and tiger skin draped over their shoulders on a colorful armor. The horses dressed with red mane and in full caparison with rosettes, in the shape of capped mushrooms, on their back and knotted tails. 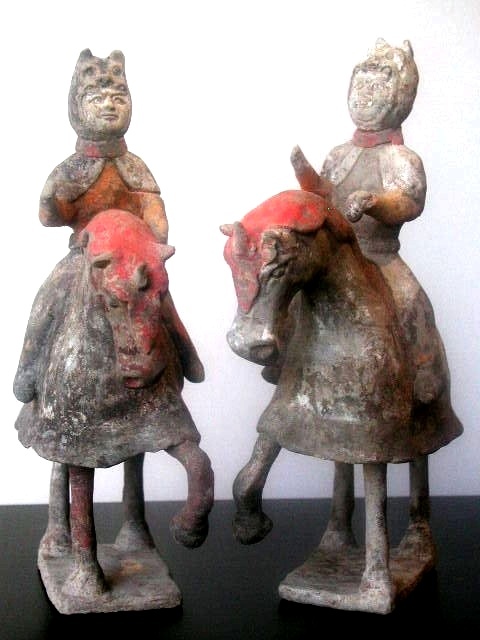 Sui Dynasty (AD581-618). H. 10.75 (27.3 cm), L. 9 in (23 cm). Oxford T.L. tested.